New Democracy (ND) leader Kyriakos Mitsotakis spoke of the battle of the Euroelections at a party event at Corfu. 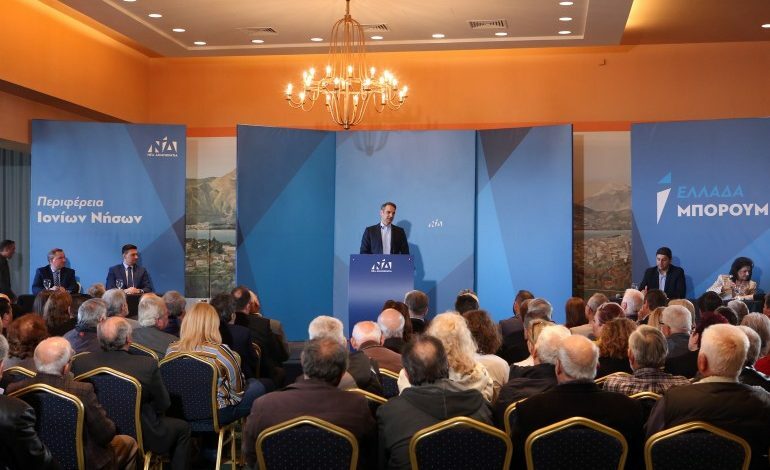 Mitsotakis who was visiting the Ionian island on Saturday said that we should vote for the Europe we want and for a powerful Greece in a Europe that must change. “But we will not vote only for this because if the Euroelections precede the national elections then, in essence, the Euroelections will be the first half of a match with two half times and in the first half New Democracy must score many goals”, Mitsotakis said. 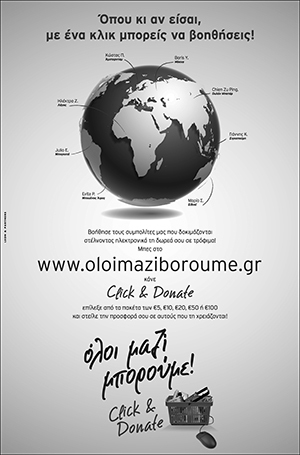 We will remember Mr. Tsipras for the taxes, for his lies, for the Prespes Agreement and how he gave away the Macedonian language, we will remember him for the division and the poison in the political life and also for the way he humiliated the highly advertised moral advantage of the Left. “The vote in the Euroelections is crucial for Europe’s future” Citizen Protection Minister Olga Gerovassili said in an interview with the Sunday edition of Ethnos newspaper. “The ballot result will be the answer to those that want to impose the extreme austerity, a society without cohesion and another system of values without democratic rules and principles that believe normal the neo-fascist, the racist and the nationalist” she said. On SYRIZA-Progressive Alliance euroballot, she said that it is a historic and political necessity for the formation of a strong progressive front against the neoliberalism and the far-right and has no characteristics of opportunistic alliances and political tactics to make Alexis Tsipras stronger but the need for safeguarding the equality and the rights and the deepening of democracy. Referring to the Euroelections she said that for SYRIZA and for the whole of the progressive forces “is a crucial battle against Europe’s conservatism. 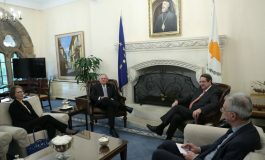 The rallying of the progressive forces is necessary in order the major challenges of this period to be confronted, to strengthen the social state and to protect the rights in Greece and in Europe, noted Interior Minister Alexis Charitsis in an interview with the newspaper Nea Selida on Saturday adding that “New Democracy (ND) is not part of the solution but of the problem”. 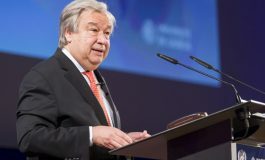 He estimated that there will be huge response to SYRIZA’s initiative after the “mobilisation of the progressive world” provoked by the rise of the far-right and accused ND that it “defends these policies”. Parliament president Nikos Voutsis said that SYRIZA strategy in terms of cooperation with the centre-left forces is totally clear, in an interview to newpost. gr published on Saturday. “We speak on conditions of alliance, cooperation and convergence in the programme and not merging and establishment of a new political party” said Voutsis while on SYRIZA’s identity he said that “it is not possible for a party that has brought together two millions of voters to still have 25-30,000 members as it had when it had significantly lower percentages”. Asked on the phenomena of deputies anti-politic behaviour, he said that “it is a phenomenon that has appeared in the crisis” adding that is very annoying that some that became known through TV to act in the parliament as it was a TV panel” he said and did not deny that there are some SYRIZA MPs that are ‘marginally” included in this group. Europe should reject the social protection deregulation and labour rights idea and choose the idea of salary increase and upgrading of the labour protection systems among its countries in order for the European building to be supported, noted Labour Minister Efi Achtsioglou speaking at the 17th annual lecture of the Greek Observatory of the London School of Economics entitled “A new model for the Greek Labour Market”. 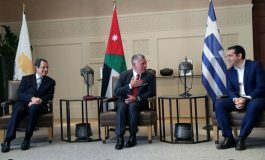 The minister presented the Greek government’s strategy on the upgrading of the labour market in Greece as an example of reforms with positive results, as the reduction of unemployment, of non-declared labour, the increase of the minimum wage and the restoration of the collective negotiations. The minister said that the deregulation of the labour market that was followed during the first two adjustment programmes in Greece, until the end of 2014, brought a general displeasure which should stop being fuelled. “The solution to the problem of rejection, by a large part of the European societies, of the European project lays in how we will be able to work for a new regulation of the labour market, for the support of the labour rights and for the wages increase. This will give social legalisation to the whole European endeavour in order to continue to exist” she said. She explained that the traditional political forces in Europe have not realised the connection between the antisocial policies, mostly in the countries in crisis, and the rise of the far-right in Europe which now is considered a major danger for the European endeavour. Achtsioglou said that the policies recently implemented in Greece constitute a good example. The solution to this issue is to see the problem and start to speak of an upwards harmonisation of the labour protection systems between the countries in order to support the European building.